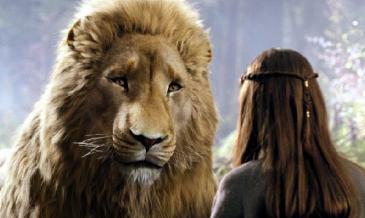 Liam Neeson (the voice of the lion Aslan) along with Georgie Henley (right) in “The Chronicles of Narnia: Prince Caspian”. For starters, Walt Disney Pictures contractually required the filmmakers for the epic film to achieve a “PG” rating. The Motion Picture Association of America (MPAA) granted it following a wide array of amendments. For example, director Andrew Adamson (who also directed “The Chronicles of Narnia: The Lion, the Witch and the Wardrobe” in 2005, “Shrek 2” in 2004 and “Shrek” in 2001 and wrote “Shrek the Third” in 2007) changed a scene with a fallen helmet to make certain it didn’t contain a decapitated head, according to the Los Angeles Times on May 4, 2008. While the “PG” rating for the recently released “Speed Racer” felt more like an opportune financial decision, the rating for “The Chronicles of Narnia: Prince Caspian” instead felt an appropriate artistic decision. Props go to Disney and Adamson for pushing its importance. 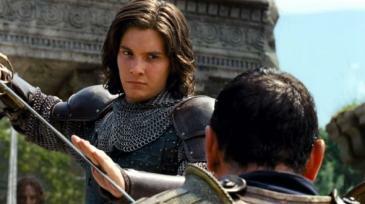 Ben Barnes as Prince Caspian in “The Chronicles of Narnia: Prince Caspian”. Despite “Troy”-like fight scenes, this was nothing like the ingenious bloodshed in “300” or the blood-spattering good time in “Gladiator”. In fact, aside from a dribble on a face or two here and there, there was no blood at all. As well, much of the brutality was implied. Instead of swinging a sword and showing the final result, the film merely illuminated the intent without the follow through. The decision didn’t detract from the purpose in the slightest, and along with making it more appropriate for younger audiences, it issued a renewed faith that Hollywood can spit out a money-generating product without having to spew gallons of blood and blow stuff up. By the way, “Speed Racer” thus far has proven to be a whopping financial failure. On a production budget of $120 million, the film as of May 16, 2008 has only grossed about $40 million in box-office receipts in its first six days of release, according to Box Office Mojo. “The Chronicles of Narnia: Prince Caspian” should fare better. The casting decisions were also a critical element here and proved refreshingly admirable. The lead actors – Ben Barnes as Prince Caspian and the four children who played the young kings and queens (Georgie Henley, Skandar Keynes, William Moseley and Anna Popplewell) – were relative unknowns. View our full “The Chronicles of Narnia: Prince Caspian” image gallery. More film reviews from critic Adam Fendelman. You may vaguely remember Barnes, though, as the young Dunstan Thorn in Matthew Vaughn’s “Stardust” from 2007. While the foursome were plucked back into “The Chronicles of Narnia: Prince Caspian” from “The Chronicles of Narnia: The Lion, the Witch and the Wardrobe” in 2005, they have long and storied careers ahead. The brilliantly diminutive Peter Dinklage (“The Station Agent”) is bold in his Narnian role as a dwarf. Perhaps even more pleasantly refreshing is the film’s decision to use larger-name talent in either cameo or voice roles. Eddie Izzard voices the mouse Reepicheep), Liam Neeson voices the towering lion Aslan, and though not credited in IMDb, Tilda Swinton indeed has a cameo as The White Witch. “The Chronicles of Narnia: Prince Caspian” opened everywhere on May 16, 2008.